Captain Kirk: The charismatic alpha-male. Picard: The unflappable intellectual (unless someone says there are five lights). Sisko: Likes to punch immortal beings. Archer: Just hoping his next warp will be the warp home. Janeway: The… Mother? Really? Is that all we’ve got? If every Trek Captain represents a different element of humanity, why does Janeway always get stuck with the gender stereotype of the Mother? Janeway’s taken down the Borg, negotiated with the Hirogen, tied the spacetime continuum into an ugly mobius bow and left her salamander babies on a Delta Quadrant planet (but most fans never speak of that) Why then do we accept that Janeway represents the Mother instead of the human element she really embodies: Passion. Voyager comes to the aid of the USS Equinox, another starfleet vessel trapped in the delta quadrant, under attack by interdimensional aliens. Turns out Capt. Ransom and the crew of the Equinox were killing these aliens so they could use them to power their “Warp Drive Plus” and get home in months instead of decades. 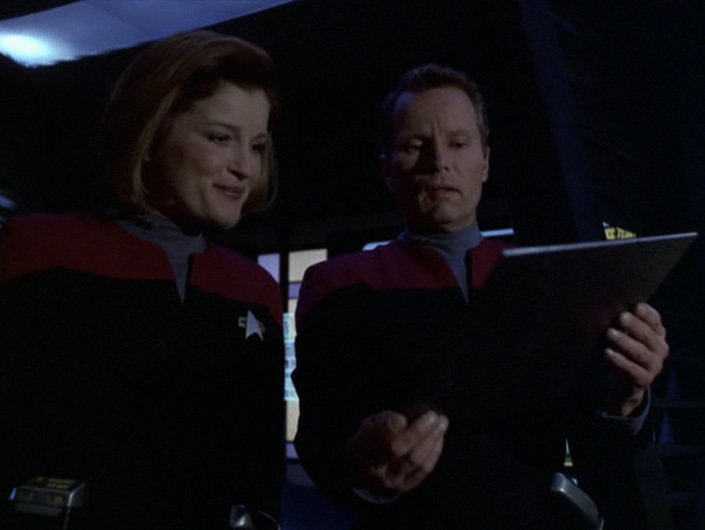 This prompts Janeway to launch a personal vendetta to take down Ransom and crew. Seriously, watch the episodes. My favourites in Voyager. “But wait Steve! You said Janeway was all about ‘Passion.’ All I see here is a Starfleet captain out for vengeance.” Glad you spoke up, imaginary voices of the zeitgeist in my mind. What we actually see here is Janeway behaving in a way not typically reserved for Captains: she’s being human. At the beginning of this episode Janeway is your stereotypical Starfleet captain: ready to lend a hand to someone in danger, well disposed towards Starfleet officers and altruistic to a fault. But the change in her when the Voyager crew discovers Captain Ransom’s plan is downright chilling. 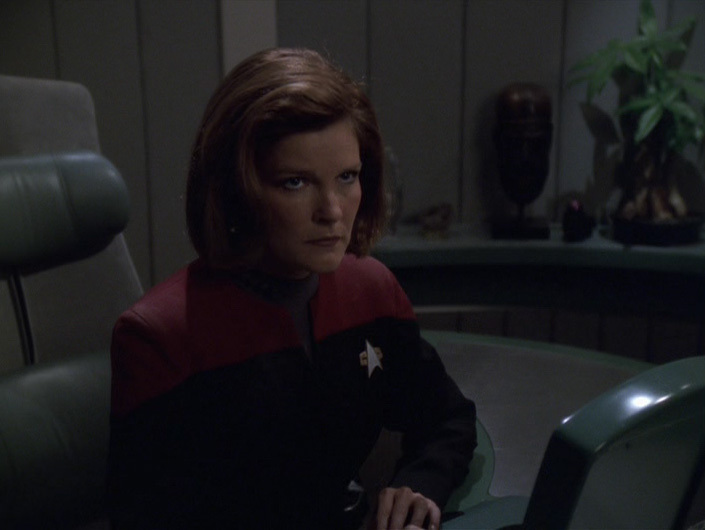 We’re all aware of the Shatner school of over-acting, the wide-eyed-rage of Sisko or the rarely used sharp, pronounced tones of a pissed off Picard, but watching Janeway address Ransom in her ready room is a study in restraint. The usually kind, affable Janeway is stiff and rigid. Janeway is livid. Janeway is outraged. Janeway is furious. And the only way for her to get through that meeting with Ransom without burning holes through his head with her eyes is to keep that rage contained. In TOS, Kirk faced several instances of Starfleet captains abandoning the prime directive (“The Omega Glory”, “Whom Gods Destroy”, “Bread and Circuses”) and going rogue, but Kirk never made his mission to stop them a personal vendetta as Janeway admits to in “Equinox Part II.” Janeway is offended by Ransom, with good reason: The callous murder of sentient life doesn’t sit well with her or the Prime Directive, but Ransom’s betrayal goes deeper than that. In meeting Ransom, Janeway is faced with a dark mirror of her own actions. For five years she’s struggled to keep her crew together on the path home while trying to adhere to the Prime Directive. 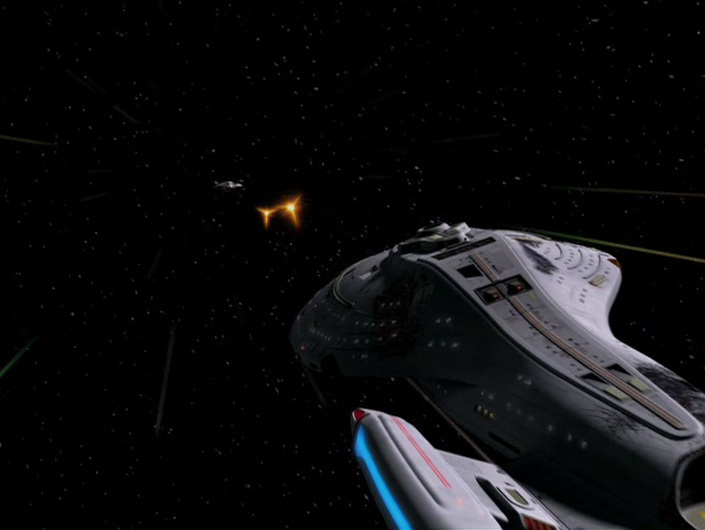 Then Ransom and the Equinox appear, embodying everything Janeway has fought to reject. He broke the Prime Directive, he broke his oath to Starfleet, and he and his crew seem indifferent. He immediately invalidates all of Voyager’s struggles by showing how easy it would be to take the lesser path. Where Janeway fought so hard to maintain her principles, Ransom cast them aside when he thought it could benefit his crew. And for a while it looks like Ransom and the Equinox will defeat Voyager and make it home long before they do, a fate Janeway cannot stomach. So she makes it personal. She rejects her rationality and her intellect, and instead goes with her heart. When given the choice between pursuing Ransom and his crew or trying to communicate with the interdimensional beings, Janeway decides to go after Ransom, refusing to entertain Chakotay’s insistence that communication with those attacking them should be their top priority, rejecting the very Star Trek thing to do. When Chakotay confronts the captain with her choices later, Janeway freely admits that her pursuit of Ransom is personal, and she relieves Chakotay of duty to prevent him from interfering with her desire for revenge. Janeway cannot permit the dark mirror of herself to roam the galaxy unchecked. But Starfleet captains have dealt the personal affronts before. Picard’s capture and conversion into Locutus by the Borg can be seen as a much stronger violation that Ransom’s betrayal of Janeway and Starfleet, but because Picard is the intellectual diplomat, he handles the situation much differently. Less than two years after his assimilation Picard is faced by the Borg again in “I, Borg” and we do not see him pursue a path of vengeance, we see him make the humane, sympathetic choice that Starfleet is known for. Kirk “never trusted Klingon’s and he never will,” but even he sees the logic of making peace with them at the end of The Undiscovered Country. This is why Janeway is “Passion,” because Janeway represents the Human condition better than any other captain. It’s the darkest part of her humanity that sends her off the deep end in pursuit of Ransom, reason and rationality be damned. She reacts the way many in the audience would want to react, with humanity rather than rationality, with emotion rather than intellect. By the end of the episode Janeway has come to her senses and recognizes the danger she placed the crew in, and we as the audience understand even a Starfleet Captain can make mistakes. This Starfleet captain is passionate, subject to emotions that can be difficult to control. She is flawed. She is Human. Personally the characteristic I have always thought of in connection with Janeway is faith. Faith in the rightness of her decisions, faith in her ability to get them all home. Sometimes that faith borders on arrogance such as when she at first summarily decides to have The Doctor’s memory wiped after he goes into brainlock. But most of the time her faith is tempered by reason and in the end she does get them home. I like your view that ‘Faith’ is the key characteristic of Janeway. I still enjoy ‘Passion’ as it seems to touch on more of Janeway’s quirks when she’s in a crunch. Even using ‘Equinox’ we have an example where Janeway actually puts aside her ‘faith’ (in this case, Chakotay can take on the mantle of ‘Faith’, since he continues to adhere to Starfleet codes and methods even when Janeway doesn’t) as in her reliance on Starfleet and its principles, in favour of following her ‘heart’. If she listened to Chakotay, she would know that ‘communicating’ with the enemy was truly what they should be doing, rather than tearing off across space after Ransom and the Equinox. Faith is an excellent trait of Janeway, but this particular episode seems to show that something more ‘primal’ was motivating Janeway’s actions. This was quite funny, Jarrah. As to Captain Janeway — I get that “The Mother” description can seem reductive. I don’t think I would give that primary identification to the Janeway character, but given the small crew, isolation, and the long journey ahead, I don’t think it’s entirely pejorative. I think of Admiral Adama as “The Father” of Battlestar Galactica and the fleet. But I do agree with your evaluation of this episode. Janeway is my second favorite captain – mostly because of her flaws. I think she’s one of the most human of all the captains. She makes mistakes, and this episode has those on display as you write. My boys and I were recently talking about the role of Star Trek first officers, and J/C shipping aside for a moment, I think Janeway has the most domineering relationship of all captain-first officer roles. She is such a big personality; this is one of (many?) reasons why Chakotay can seem a smaller character. Between this two-parter and “Scorpion,” we see that Janeway is often less cooperative with her first officer and more “I’m doing this and you’re with me, and that’s all I want to hear.” That’s not a criticism, it’s just her command style. I just always think she’s a little too fast to relieve Chuckles of duty, at times. This is not her finest hour, but that reveals a lot about the character that I enjoy and cherish. That is Kathryn Janeway to a “T”. I’ve always noticed that when she’s really pissed, her voice tends to drop to a near whisper. It’s rather scary to hear. Have we forgotten “Star Trek First Contact”, when Picard literally transformed into Captain Ahab before our eyes? Well Capt. Janeway is an idealist who could not accept the fact that Capt Random’s crew was starving to death and protocals provided Randsom authority to servive by any means possible. Further, after the accidental killing of the alien, it was war because the aliens wanted retribution. So, only one alien was killed by accident and the others died by contest of war.